Next week the streets surrounding the historic Hendricks County Courthouse in downtown Danville will come alive during the 18th Annual Fair on the Square hosted by Danville Tri Kappa. The planning committee has been hard at work, orchestrating a variety of vendors, concessions and entertainment that you won&apos;t want to miss. Hendricks County is glorious this time of year when fairs and festivals abound. This year&apos;s Fair on the Square will offer a fun-filled weekend with good food, unique shopping and exciting entertainment. The event will run from 10 a.m. to 6 p.m. on Sept. 12 and 10 a.m. to 4 p.m., Sept 13. Booths will line Washington, Marion and Jefferson streets around the courthouse. With sponsorship from Hendricks Regional Health, Fair on the Square will offer two days of FREE entertainment that folks from all ages are sure to enjoy. Saturday&apos;s lineup will include music from the bands: Guys that Rock, The Whitney Erin Band, and Will Scott. The fun doesn&apos;t stop there. Explosions, Inc. will present two action-packed science shows: Extreme Chemistry and Zombie Science. Follow the links to learn more about each of these awesome entertainers. Sunday&apos;s entertainment will be provided by four rock groups - comprised of students ages 11 to 17 from the Launch Pad Rock School in Plainfield. Come prepared to hear covers ranging from current radio hits to classics from the 1960s and beyond. Four groups of young rockers performing your favorite hits, how cool is that? 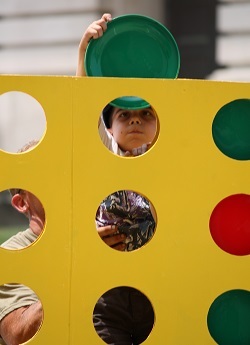 Life-sized versions of classic games such as Connect Four and Jenga can be found on Sunday at the corner of Washington and Marion streets. Challenge the kiddos to a game or two. That&apos;s two full days of awesome entertainment - and it&apos;s absolutely FREE. Danville Public Library and the Historical Museum will also be open and offer activities. Be sure to check out the businesses along the square as well. Other community events are planned to coincide with Fair on the Square. Danville Parks and Recreation will host the Hendricks County Half-Marathon on Saturday. The starting line is at the corner of Washington and Marion streets - where runners and spectators will be in perfect proximity to the many breakfast options offered in the fair concessions area. Vendors will have breakfast sandwiches, biscuits and gravy, breads and other baked goods for purchase. If you plan to visit later in the day, you&apos;ll find a wide variety of lunch and dinner options - burgers, pork tenderloin, brats, coney dogs, chicken wraps, gyros, sandwiches and walking tacos are just a few off the menu. The Danville Fire Department will also have their meal stand open for business just west of Jefferson Street on U.S. 36. Trust me, you can&apos;t miss them. Just let your nose guide you. An exciting addition to this year&apos;s Fair on the Square is a beer garden, sponsored by Diesel&apos;s Sports Grille. You can find this - and all concessions - perfectly positioned near the entertainment tent. Grab a bite, drink a beer and enjoy the shows. Get your kettle corn and peruse the sea of shopping booths you&apos;ll find at this year&apos;s fair. Danville Tri Kappa&apos;s Fair on the Square committee worked hard this year to obtain a variety of vendors. 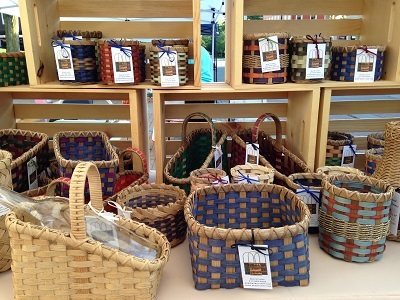 Items range from traditional retail items to homemade, homegrown and handcrafted. You&apos;ll be able to find up-cycled home decor, a variety of clothing items, purses, jewelry, home fragrance items, skin and beauty products and much more. Don&apos;t forget to stop by the farmers market booths and pick up some locally grown, delicious produce. In addition to retail vendors, some great Hendricks County not-for-profits -- such as Girl Scouts and animal rescue groups -- will also be at the fair as well as several business booths that will be offering services such as massages and spinal screenings. This year&apos;s Fair on the Square schedule is truly filled with fun for the whole family. Come on out and join us. Proceeds from booth rentals will be returned to the community in the form of scholarships for high school seniors in the spring. Last year&apos;s event allowed this philanthropic organization to give out three, $1,000 scholarships. Directions, the entertainment schedule, and more information can be found by clicking here. Once you arrive, be sure to stop by the Tri Kappa booth to get an events map. It&apos;s going to be a great weekend, we hope to see you there.